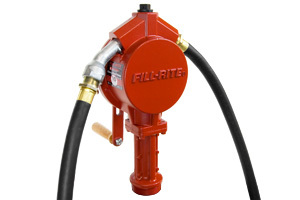 Cast aluminum Fill-Rite pump provides smooth, continuous transfer of medium viscosity liquids, as well as oil, gasoline and diesel fuel. Improved seal keeps water out. Built-in check valve and strainer. Pump easily mounts to a standard drum with 2in. NPT. Anti-siphoning device, hose with static wire and a 22in. to 40in. telescoping suction pipe. Padlockable pump can be set up for reverse flow and is adaptable for drums, kegs or storage tanks. U.S.A.
Adaptable for drums, kegs, and storage tanks. Anti-siphoning valve Check valve and strainer. Pump can be set up for reverse flow. Pump may be padlocked. Series 800C meter is available. Steel handle and wood grip.